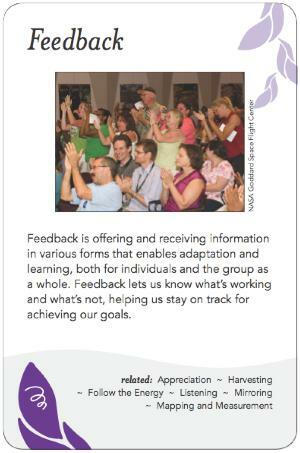 Feedback is offering and receiving information in various forms that enables adaptation and learning, both for individuals and the group as a whole. Feedback lets us know what's working and what's not, helping us stay on track for achieving our goals. Negative (dampening, balancing, self-correcting) feedback, which puts a limit on something; the classic example is a thermostat that turns off the heat once the room reaches a certain temperature. In group dynamics, Feedback is mainly about making the effects of our actions visible, so we can understand our impact and make conscious choices. For example, let's say that week after week in a group, the same few people tend to talk while most of the group remains silent. Perhaps one week, someone might record how many times each person speaks and then post it publicly at the end of the meeting, thus inspiring the group to share the airtime more equally at the next meeting. In the words of Gregory Bateson, feedback enables us to tune into "the differences that make a difference," to differentiate and coalesce. Feedback is information, and we have a choice about how to respond. In the above scenario, one of the more frequent speakers could get really defensive, which might not be a useful response. As convenors we want to cultivate a culture of curiosity, so that people will be interested in feedback and seek the good in it, recognizing that any organization that shuts out feedback will not survive. There is a match between the rate of change and being able to see the effects of our actions, thus curiosity supports emergence. EDIT: Include nonverbal gestures . . .
What we pay attention to tremendously affects the outcomes we get. So the first question about feedback is going to be: what indicators do we use? Feedback is sometimes related to relationship, sometimes to task. It could be formal measurement mechanisms (say, filling out evaluation forms at the end of an event) or informal (it's happening all the time whether we consciously notice it in those terms or not). Basically we need some way to know whether we've been successful at moving toward our purpose. Even simple reflective listening to a participant is a form of feedback, along with all the other forms listed in the Mirroring pattern. Feedback is multilayered and operates at multiple levels: intrapsychic, interpersonal, and group field. There are also different ways of producing or taking it in: numeric, internal, intuitive, rational, sensory, etc. Once feedback is offered, how it gets handled itself becomes part of another feedback loop. Feedback can be amplified by technology, as in the use of keypad polling. At large scale, "crowd sourcing" uses the power of a wider public to distill or assimilate complex knowledge. Whatever form is used, things shift when people experience themselves in context. When the first pictures of the Earth from space arrived, the view of the planet without any political boundaries affected many people's view of themselves and others. For feedback to be effective, you need to attend to many sources; if you listen to only one part of the system, it's easy to get thrown off by distorted impressions. If the energy of a room is amplifying, reining it in too soon might cut off creativity. For interpersonal feedback, there is a lot of sensitivity required. Make sure people are ready to receive it and that the timing is right, otherwise the message won't get through. The business world starts exploring the kinds of feedback mechanisms that the alternative culture world has been using for decades. The Fifth Discipline: The Art and Practice of the Learning Organization by Peter Senge"
The Language of Systems Thinking: 'Links' and 'Loops' by Michael Goodman, Jennifer Kemeny, Charlotte Roberts. Feedback Form that the individuals in a group can fill out to let other members know how they'd prefer to be approached in the event of positive or negative feedback. FIC's Feedback Gifting Process offers a nice balance between openness and discretion.